When Life Gives You Eggs… Make More Dessert! In my first post, you heard that, as an adult, I did not waltz into the kitchen with a smile on my face. As a child, however, I loved being in the kitchen, if only to bake desserts. Shortening, sugar, eggs, vanilla, flour, soda salt! I could recite the recipe for chocolate chip cookies by the time I was four. It’s only fitting that I’m working my way into food blogging from the sweet side of life. We started with Limoncello, a digestivo (after-dinner drink), moved on to Tiramisu, and here you’ll find a quick recipe for Lavender Crème Brulée. Lavender seems to be blooming everywhere in Oregon’s Willamette Valley right now. I love the sight and smell of it, and I cannot resist wrapping my fingers around a stalk of flowers as I pass, carrying the fragrance away with me. I also happen to have a refrigerator full of yummy eggs, thanks to Ian, the grade-schooler up the road who is learning about raising chickens and the business of selling eggs at a young age. 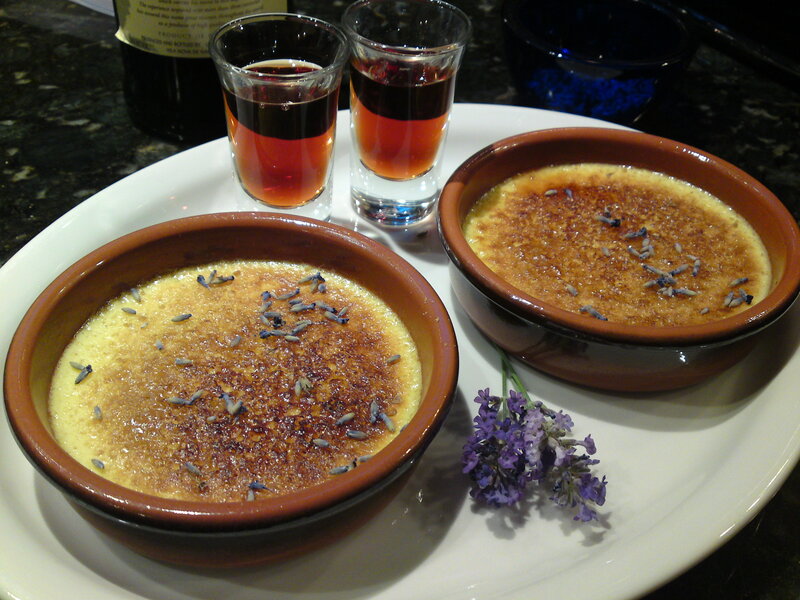 I’ve made and enjoyed plain crème brulée many times, and the idea of lavender-infused brulée intrigued me. Online, I found recipes that called for as little as one tablespoon of flowers infused for 3 minutes, up to ¼ cup of flowers infused for 1 hour. I wanted more than a hint of lavender essence; I didn’t want something that tasted like soap. I experimented with 3 tablespoons of flowers and sampled the infusion along the way to decide when to strain the flowers. I’m perfectly happy with these results, but I also encourage you to experiment with the recipe to find out what tickles your food fancy. Unlike Tiramisu, there are no specialty-store ingredients, and it’s one of the easiest desserts I’ve ever made. As always, start with good ingredients: fresh, fresh eggs, and fresh lavender flowers. The recipes I’ve seen for lavender crème brulée call for dried flowers. I’m not sure why you’d get more flavor out of dry rather than fresh, so I met the idea in the middle and stripped a couple of lavender stalks, spread the florets on a tray, and left them on a shaded window sill for a couple of warm days. 4 to 6 ramekins. (Oven-safe coffee cups will work in a pinch. They may not be as “presentable,” but they won’t change the taste of your crème. A baking dish or cookie sheet to hold water around your ramekins as they bake – which depends on how tall your ramekins are. Warm the cream on the stove, but do not boil. Add the flowers (saving a few pinches for garnish) and let them infuse for ½ hour. Taste the cream – if you are satisfied with the hint of lavender you taste, strain the mix into a bowl. I found that I wanted more of a lavender taste, so let the flowers infuse for another ½ hour. 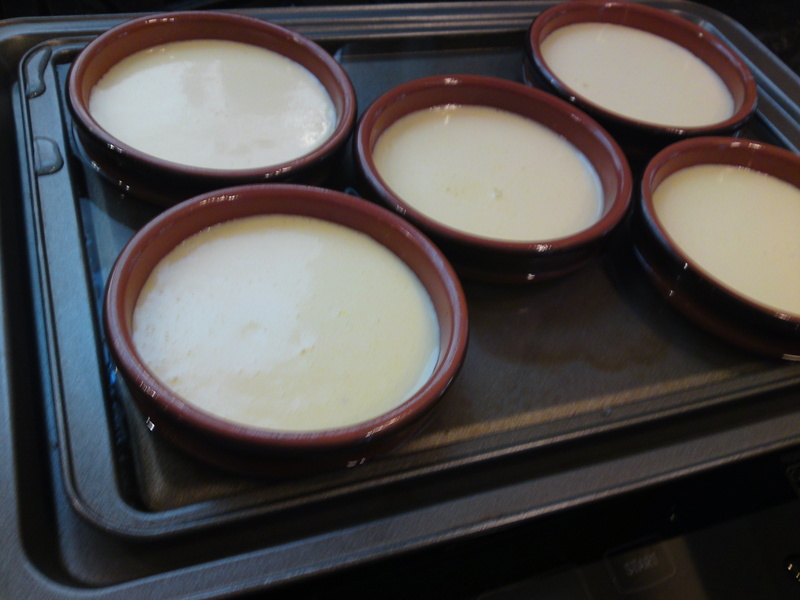 When your happy with your infusion, preheat your oven to 275 degrees and butter 4 – 6 ramekins. 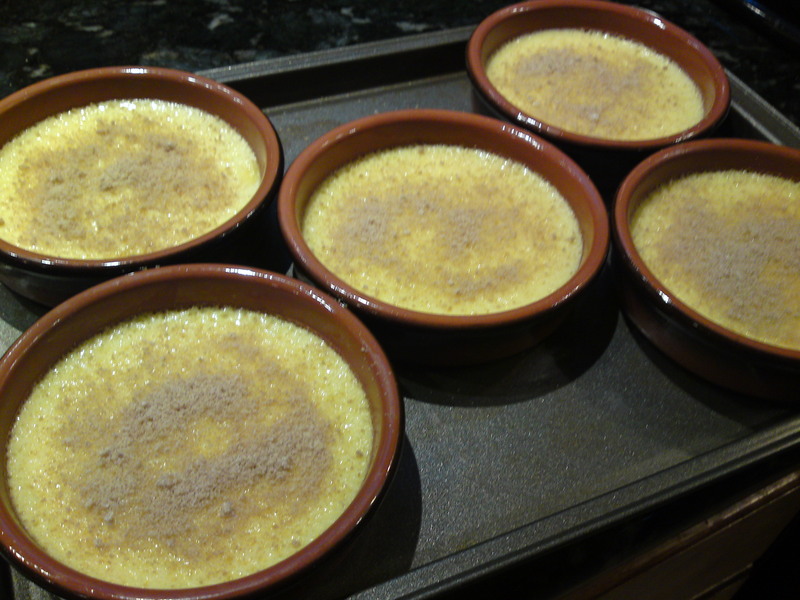 (I say four to six ramekins because I prefer crème brulée a little thicker, and therefore make fewer servings. Both work well.) Next whisk the egg yolks. As they start to thicken, slowly add the sugar, a bit at a time, and whisk until the sugar is dissolved. 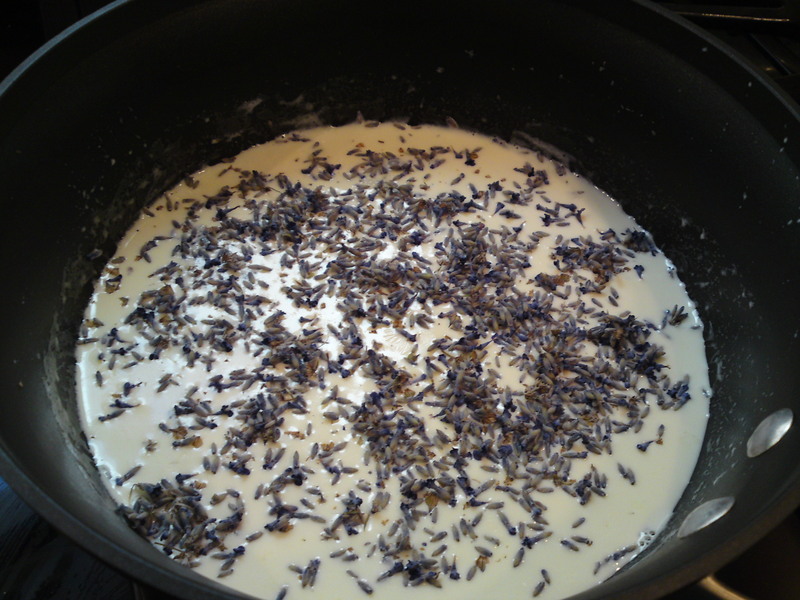 Whisk together the strained lavender cream and yolk mix. Divide into the ramekins. Place the ramekins in your dish and pour warm water into the dish so it comes about ½ way up the sides of your ramekins. These ramekins are short, so I use a cooking sheet. The second sheet is to avoid spilling water while moving them in or out of the gas stove. Bake uncovered until just barely set, approximately 45 – 50 minutes. The exact time will depend on the size of your dishes. If the mixture jiggles when you slide the dish out from the oven, put it back in for 5 minutes. Keep an eye on it as it goes from soft to set quickly. Set the tray to cool on the counter, and turn the oven off. While it’s cooling, place your brown sugar on a cookie sheet, place it in the spent oven, and allow it to dry out. This will take 10 – 20 minutes, depending on how warm your oven is when you get the sugar in there, how thin you’ve spread the sugar, and how well the oven retains heat. Once the sugar is dry, scoop it into a closeable bag and roll over with a glass or rolling pin until it is crushed fine. When your crème brulées cool, wrap with plastic wrap and refrigerate for at least a couple of hours up to a day. When you’re ready to serve, dust each brulée with brown sugar and place them under a hot broiler for one to three minutes. Keep a close eye on the topping! You want it to carmelize but not burn. Remove the brulées as the sugar carmelizes, turning or repositioning as necessary. At this point, you can either serve immediately or refrigerate for up to 45 minutes before the carmelized topping starts turning gooey. To serve, sprinkle the florets you saved for garnishing either on your serving dish or on each brulée (the latter will obviously increase the lavender flavor, as well as change the texture of a spoonful of crème — but it sure is pretty!). I think tawny port is a lovely accompaniment, followed by a nice shot of espresso. Enjoy! After making and loving this dessert, I think I’ll experiment with savory rosemary crème brulée next – perhaps with a hint of goat cheese? That, of course, means I’ll have a dozen egg whites just waiting for… could it be time for angel food cake? What a nice idea! I love lavender in desserts! Thanks! Can’t say it’s original, but I love that writing about my experiment with it may encourage others to give it a whirl. If you do, I’d love to hear how it turns out. k.
I just finished reading all your blogs. I must say you are an amazing lady who has lived a very interesting and adventurous life (little bit of envy). I look forward to enjoying more of your stories and trying your wonderful recipes. Keep up the great work. What perfect timing with all the lavender in bloom. Sooo delicious, My family enjoyed this recipe immensely! !Thank you so much Kathleen for showing me how to make this!